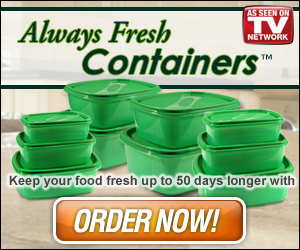 The Always Fresh Container system is a handy new kitchen product at the forefront of the food storage frontier. These smart storage containers are made with a natural and environmentally friendly material that helps extend the lifespan of edibles by absorbing and removing food-spoiling ethylene gas released during the natural ripening process. Always Fresh Containers also help prevent vitamin loss without the use of harmful toxins. * Bonus: FREE Always Fresh 10-piece value set.